Music magazine Record Collector has a feature on 100 rhythm and blues songs ‘that changed the world’. Bob Solly, who played in David Bowie’s first band The Manish Boys, celebrates the potency of American blues artists and their effect on the British beat boom. He selects 100 tracks that were picked up and covered (on record, or just live) by British bands in the early 1960s. As you would expect from Record Collector there are plenty of record label/sleeve shots and pictures of the blues artists who played them. Part 1 of the feature is in the August edition that is available now, with Part 2 to follow next month (on sale July 31st). Also of interest in the August issue is a piece on the late Bo Diddley, an interview with The Pretty Things singer Phil May, and a piece of ‘the roots of Paul Weller‘. 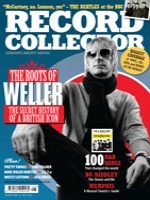 To subscribe to the magazine visit the Record Collector website here .